What Is The Best Workout For Continuing Your New Year's Resolution? What is the best workout for continuing your New Year's Resolution? If you are eager to succeed this year, keep reading to improve your motivation and goal setting skills. Included is a 5-day split workout to fire up your spirits! Since the New Year the gyms have been filled with new members trying to achieve their New Year's resolutions. However, we all know that these new members don't usually last long. Even with a beginner workout some of these members just can't seem to keep up with it. Why do these people seem to have such a quick loss of motivation? First, let's quickly examine what motivation exactly is and where it comes from. There are many different studies on motivation out there and everyone has their own perceptions on and definition of the word "motivation." Let's use Mitchell's study as an example. In a theory about motivation, in which motivation is described by a few characteristics, Mitchell defines motivation as "the degree to which an individual wants and chooses to engage in certain specified behaviors." Figure 1: A Simplified Illustration Of The Basic Motivational Model Applied To A Fitness Goal. Looks pretty easy, huh? Well, it actually is. In order for this continuous cycle to work, all of these stages (or beacons) and chains have to be available. So if one stage is incomplete, the model doesn't apply. For beginners, this is often the fulfillment chain [that's missing] for example. New gym members have their goal set and have their own expectations, they have changed their lifestyle (the diet and training are altered and cardiovascular activities added), but the one thing that they are still missing after a few weeks is fulfillment. These new gym members look in the mirror and still can't see any results (usually because visible results appear after about a month or a little less). Or they have been so dedicated the first few weeks, they expect to see results that they couldn't have gotten yet. In addition, some people that are as motivated for the first 2 weeks as just described, and that have changed their diet so radically that they cut out on things rather than eating less of it they can't resist the temptation of the food again after a while and therefore start eating it again and lose motivation. Just discussed is the most common problem among new gym members that lack motivation after a while. It could also be that people don't even have an appropriate driving force or a realistic goal. "Kreitner et al. Suggest that although motivation is a necessary contributor for performance it is not the only one. Along with ability, motivation is also a combination of level of skill; knowledge about how to complete the task; feelings and emotions; and facilitating and inhibiting conditions not under the individual's control." Let's say that the inhibiting and facilitating conditions are under this new gym member's control, however, the level of skill and knowledge about how to complete the task aren't. In this situation, the new gym member doesn't even pass the second stage of the previous mentioned model just because he/she doesn't possess the knowledge of how to reach the goal (they haven't of heard the website Bodybuilding.com yet!). Ensure the goals you set are very specific, clearly defined and easy to measure. Instead of setting a general goal such as: to lose weight or be healthier, set a specific goal such as: to lose 2cm off your waistline or to walk 5 miles a day at an aerobically challenging pace. How do you know, if a goal is completed? If you formulate a goal, you should state how you are going to measure it upon its completion. Measuring can be done according to certain standards and these standards, in turn, can be quantifiable (e.g. number of mistakes made, time needed to complete an assignment) or qualitative (e.g. good quality of a presentation). Quantifiable standards are relatively easy to formulate. Qualitative standards are far more difficult to formulate, as these need to be defined in advance. You could impose a scale system where 1 is low and 10 is high. For example: if your goal is to put the fun back in something you used to enjoy, give yourself a fun rating prior to the exercise and a fun rating afterwards. Goals you set that are too far out of your reach, you probably will not commit to doing. Although you may start with the best of intentions, knowing that it is too much for you means your subconscious will keep reminding you of this fact and will stop you from even giving it your best. A goal needs to stretch you slightly, so you feel it can be accomplished, but it will need a real commitment on your part. For instance, if you aim to lose 20 lbs in two weeks, we all know that is not achievable, however, setting a goal to loose 1lb is. When you've achieved that, aiming to lose a further 1lb, will keep it achievable for you. This is not a synonym for "easy." Realistic, in this case, means "do-able." The goal needs to be realistic for you and where you are at the moment. A goal of never again eating sweets, cakes, crisps and chocolate may not be realistic for someone who really enjoys these foods. Be sure to set goals that you can attain with some effort! Too difficult a goal, and you set the stage for failure, but too easy a goal sends the message that you are not very capable. Set the bar high enough for a satisfying achievement! You should specify a time during the day/week/semester when you will work towards fulfilling your goal. If you do not set a time, your commitment might not be a priority and there is no urgency to start. If necessary, you can break up a large task into smaller steps and consider whether each step should be a goal in itself. Do not forget to monitor your progress in this case." Figure 2: Representation Of Herzberg's Two-Way Factor Theory Applied To A Fitness Goal. The Satisfiers Should Weigh More In Order To Stay Motivated. Figure 3: When The Driving Force Stage From Figure 1 Isn't Filled In Properly, It Could Lead To Frustration. This Frustration Might End In Aggression, Regression, Fixation Or Even Withdrawal From Trying To Achieve The Goal. Applied: People aren't motivated to stick to their New Year's resolution anymore and should therefore modify their goal (or set up a new goal using the SMART method). Without further elaborating on it, it is clear that motivation is a complex process. Though it can be influenced by the environment, it is mostly a internal process. What Is The Best Workout For Continuing Your New Year's Resolution? Be Specific. The best workout for people in order to continue their New Year's resolution is a workout routine that people like to follow. Though it is important to once in a while change your workout routine and to try different things to stimulate muscles in a different way, if one has been trying out a new and completely different workout [from their first] there might be a possibility that the person will be less motivated (depending on how they liked their first workout routine). However, there are some factors that might influence the motivation for doing a certain workout. Some people are more convenient with using machines, and in that case they should stick to them. Others, e.g. people that are more into powerlifting, might feel better with compound exercises with free weights. This really depends on the person. Another factor to consider is time. If you're the kind of person that likes to be in the gym a little longer, then do that. If you, however, like to get it done quick, then just stick to a short workout routine. Either way, keep it between 30 and 60 minutes in order to have an efficient workout. Here's a sample routine (5-day split) from which some people, including me, have gotten some good results of. Whether your goal is either to bulk up or to shred of fat, this cycle can be used for both. It's a misconception that you are supposed to do more sets with more repetitions when in a cutting cycle and that strength is minimal in that period (some people break their PR while they're in a cutting phase). Do some research and read some articles about your goal. Here is a link to a huge collection of training articles. What Are Some Ways To Keep Motivation High While Trying To Continue Your New Year's Resolution? If your current workout routine is boring and you feel (and know by keeping track of your measurements and stats!) you're not really making progress, then it's not wrong to properly change things up a little bit. Buy and read bodybuilding magazines, visit the Bodybuilding.com supersite, watch bodybuilding movies; do whatever that motivates you to go to the gym or to reach your goal. Since everybody is different, you might have try out different things but this is the only to find out what's best for you. This goes for both supplements as well as training. Talk to fellow gym members. Find out how they (have) reach(ed) their goal. Take everybody's advice into account when setting up your goal. Make going to the gym more fun; listen, for example, to music during your time at the gym or find other non-related things that motivate you. Figure 4: Everybody Has Something Or Someone That Motivates And/Or Inspires Them Or That They Would Like To Relate To. 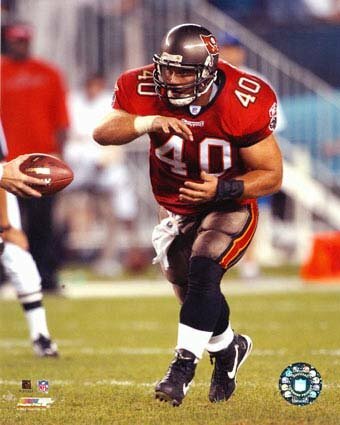 Shown In Picture: Fullback Mike Alstott From The Tampa Bay Buccaneers. When necessary, take supplements to make it a little easier on you. Just remember, supplements are no replacement for a healthy diet! Can They Be Saved Or Are They A Lost Cause? You're never lost and it's never too late. Get back on track and set up a realistic goal! Visit Bodybuilding.com and other fitness related websites often and get knowledgeable about how to reach your goal. Once again, if you know how to reach your goal and if you're able to stick with it, you will definitely achieve the results you want (Performance = function (ability x motivation)). Like one of the sayings that appeared in one of the movies of Ronnie Coleman; "knowledge is the key to success!". Laurie J. Mullins. Pearson education limited. Essentials of organisational behaviour. 2006. Part 2, chapter 5, page 184 - 185.